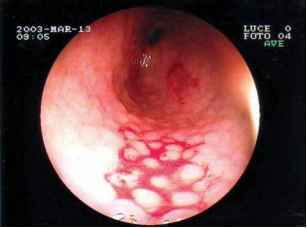 Figure 6.3 Endoscopic appearance of a Helicobacter pylori-associated peptic ulcer of the posterior wall of the duodenal bulb in an 11-year-old girl. Figure 6.4 Endoscopic appearance of Helicobacter pylori-associated multiple peptic ulcers of the gastric body and hyperplastic regeneration of the surrounding mucosa in a 12-year-old girl. Some endoscopic pictures might be suggestive of inflammation and/or be specific for a given etiology, but confirmation of the initial impression and definitive diagnosis is dependent on histo-logical examination. 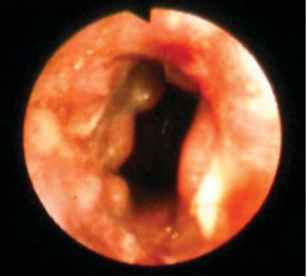 For this reason, each endoscopic examination must be completed by biopsy sampling of both endoscopically abnormal and normal mucosa. At least two biopsies for H. pylori detection must be taken at the antral site. Further sampling from the fundus may be useful, especially after treatment, because of the tendency of the bacterial colonization to migrate proximally. Biopsies for other procedures (culture, urease test) should be considered after sampling for routine histology. 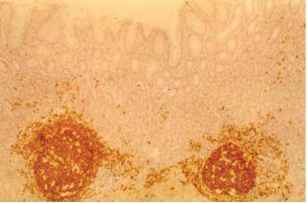 H. pylori-associated gastritis is the most frequent microscopic finding. 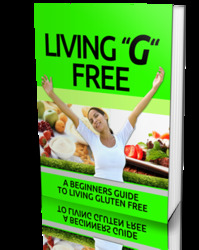 It is predominantly an antral gastritis, but in some patients, and particularly in adults, inflammation may involve the entire stomach (pangastritis). In children, its severity is usually less, and features of activity (presence of polymorphonuclear leukocytes) are reported in 40% of cases.69,90 The presence of lymphoid follicle hyperplasia (follicular gastritis) (Figure 6.6), suspected of being the histological counterpart of the nodular appearance of the gastric mucosa at endoscopy, has been reported in 20% of patients.69,90 In adults, pangastritis may show gastric atrophy and/or focal intestinal metaplasia, particularly in association with gastric ulcers. In children, these findings are rarely reported (Figure 6.7). 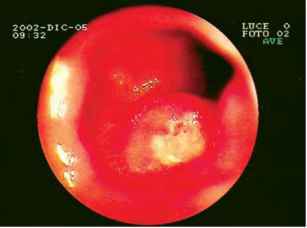 Figure 6.5 Endoscopic appearance of antral nodularity associated with Helicobacter pylori infection (a). 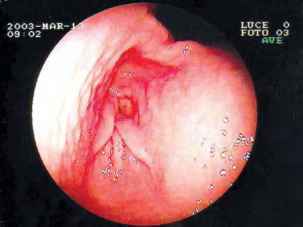 After biopsy, mucosal bleeding enhances the evidence of the picture (b). Figure 6.6 Immunohistochemical staining for B lymphocytes of a mucosa-associated lymphoid follicle in a child with Helicobacter pylori-associated antral nodularity. 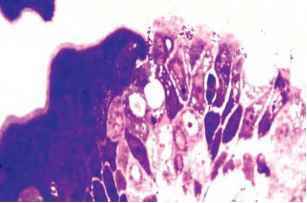 Figure 6.7 Giemsa-stained antral specimen showing, on the left side, typical intestinal metaplasia and, on the right side, Helicobacter pylori-associated chronic gastritis. Multiple samplings from the antrum, the body and the fundus of the stomach allow further subdivision of the group of H. pylori-associated gastritis into forms of gastritis whose morphological distribution patterns usually identify them as sequelae of H. pylori infection. Moreover, the group of gastritis not associated with H. pylori can be differentiated into autoimmune, chemically induced reactive gastritis, ex-H. pylori gastritis, H. heilmannii gastritis, Crohn's gastritis and a number of special forms of gastritis (see Table 6.5). The North American Society of Pediatric Gastroenterology, Hepatology and Nutrition (NASPGHAN) clinical practice guidelines (Table 6.6),96 as well as the European (EPTFHP) (Table 6.6)97 and Canadian98 pediatric consensus conferences on H. pylori infection, recommend making a definitive diagnosis of H. pylori infection through endoscopy with multiple biopsies of the stomach. 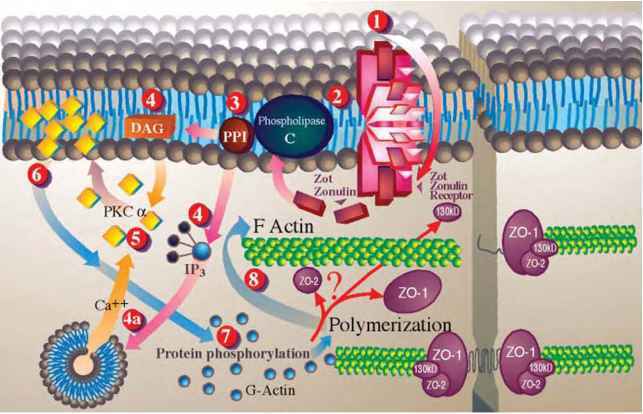 The role of non-invasive methods has to be reserved to the demonstration of eradication and for follow-up. For this purpose, the 13C-UBT is the best validated method,99 even though some problems may exist in patients younger than 6 years of age.